The most popular and powerful web development tool. Firebug caught people’s attention — and more than a million loyal fans still use it today. The story of Firefox and Firebug is synonymous with the rise of the web. We fought the good fight and changed how developers inspect HTML and debug JS in the browser. Firebug ushered in the Web 2.0 era. 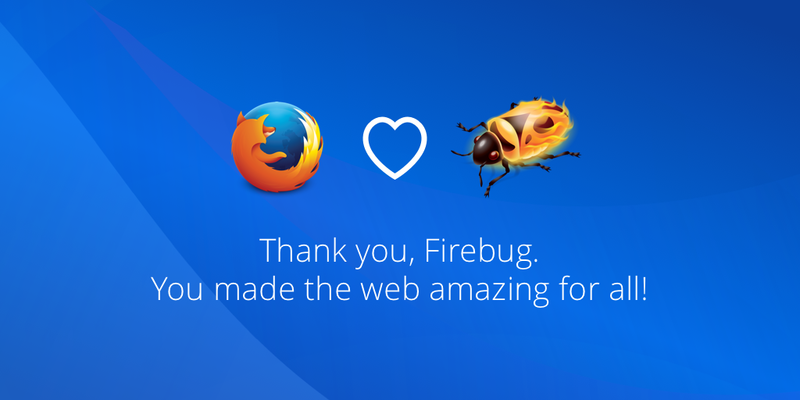 Today, the work pioneered by the Firebug community over the last 12 years lives on in Firefox Developer Tools. But before we move on, let’s take a few moments to remember all the great milestones of the Firebug project, and share some stories from early community members. Jan 2006, Firebug 0.2 Joe releases the single tab console with AJAX logging. Dec 2006 Firebug is open-sourced. Jan 2007, Firebug 1.0 The start of Web 2.0! Aug 2008, Firebug 1.2 First FWG (Firebug Working Group) release. Oct 2009, HTTP Archive (HAR) One archive for web performance and beyond. Feb 2010, Firebug Lite for Google Chrome released (bookmarklet). Apr 2010, Dynamic and Graphical Web Page Breakpoints invented (pdf). June 2014, Firebug 2.0 Fresh new UI compatible with Firefox Australis. June 2016, Unifying Firebug & Firefox DevTools. I’d like to share some of my own fond Firebug memories and historic moments, beginning with how it all started. This is a very early release – the code is only a few days old. Beware of the leopard. The first announcement is in regards to Firebug’s licensing. As I was developing Firebug 1.0, I began to wonder if I should try to turn the project from a hobby into a business. When I proposed this idea on my blog, the response was very positive and reaffirmed my belief that Firebug could do well as a commercial product. However, in the end, I just don’t feel like that is the right thing to do. I love working on Firebug because I know I’m making a lot of people happy and helping to advance the state of the art. That’s a lot more meaningful to me than just about anything else, and so, I’ve decided that Firebug will remain free and open source. Oh Firebug! Fun times. I started out as a user and contributor (of obscure debugging-of-eval features). When Joe Hewitt decided to move on, I hunted around IBM to gauge interest in continuing his work. At that time, enterprise Web apps were just starting to grow without much more than ‘window.alert()’ debugging. Once Jan ‘Honza’ Odvarko joined the Firebug effort, IBM’s Rational IDE team agreed to support my work on Firebug and I created an Eclipse plugin to integrate Firebug with the product. Honza and I filled in Joe’s great framework, scaling the tool to larger and more complex applications. We added tests and improved the release vetting, then fixed bugs and responded to bug reports to build community. Soon we had other contributors and a growing collection of Firebug extensions. Mike Collins joined me to help on the product side and I collaborated with Salman Mirghasemi at EPFL on research projects leveraging Firebug technology. I’m proud of our collective efforts to sustain Firebug during the critical growth phase of Web technology. This tool helped countless developers build sites used by millions of people worldwide. Now every browser has a debugger inspired by our work. While I miss the scrappy self-reliant teamwork of Firebug development, we leave knowing we made big positive impact. The success of a project is always dependent on the dedication of developers, contributors, and involved users. But, there were also times when it wasn’t simple to keep up with the quickly evolving Firefox browser and we had to work hard. Firebug 1.1 wasn’t really meant to be, though it was used by a few dedicated and helpful folks. So Firebug 1.2 was our first real release beyond Joe’s original source. Behind the scenes we had lots of extra work to close a security hole in Firebug. At the time we could not tell anyone: too many users were exposed. 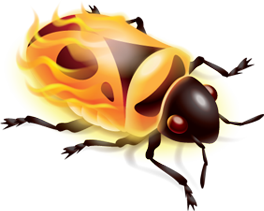 Firebug has been always very popular project and many developers started working on Firebug features, fixing bugs and building extensions. Yes, many new extensions to extend an extension. We were all using the same technology. Community happiness. Have you ever been interested in what extensions are available for Firebug? If yes, take a look at what I have found. Frankly, I was quite surprised how many Firebug extensions already exists out there. 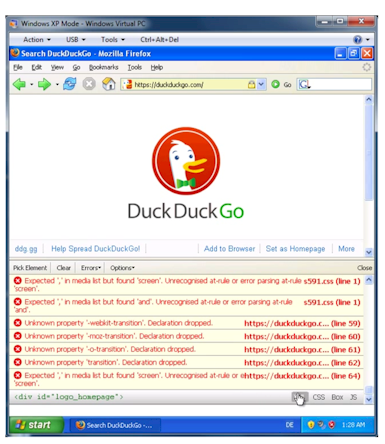 There were about 10 Firebug extensions in 2008 and more than 60 in 2011. Not easy to evolve a code base that needs to support so many extensions, trust me! I started working on Firebug in 2007 and I joined John J. Barton when he was working on v1.2. At that time, the Firebug Working Group started and we all focused on building Firebug as well as the community around it. These were exciting times. We were relatively small group and every single new feature we introduced was used by millions of people the next day. We’d been getting great amount of feedback and learning a lot about how to build visual tools for web developers. The first Firebug piece I worked on was the Net panel. HTTP monitoring was always my cup of tea and we soon noticed a lot of user requests to export data collected by the panel. Implementing such a feature wasn’t hard, the nice piece of work was introduction of a new format for exported data. A couple years later, around October 2009, we introduced the new HTTP Archive (HAR) format with Steve Souders (page-load-performance guru and author of YSlow, often considered the first Firebug extension) and Simon Perkins. This format was a great success and many tools support it now. I suggested that, rather than create yet another proprietary format, Firebug team up with HttpWatch to develop a common format, and drive that forward as a proposal for an industry standard. I introduced Simon Perkins (HttpWatch) and Jan “Honza” Odvarko (main Net Panel developer), then stepped back as they worked together to produce today’s announcement. I had good times working with John and others on the project. Because Firebug was well written and well-architected, it was a pleasure to build on top of it. Joe did a great job laying the foundation to support dozens and dozens of extensions built atop Firebug. John J.was an excellent manager and peer to work with. One of the concepts we invented and implemented in Firebug was related to a new kind of breakpoint. We called it Dynamic and Graphical Web Page Breakpoints. Yeah, you might know these features as Break on XHR, Break on Next, Break on DOM mutation, etc. If you want the Cliff Notes version, we also have a demo page. Firebug 2.0 was released in June 2014. It was a major rewrite of the UI in order to make it compatible with the new Firefox Australis theme. We delivered on time and we were proud of it, a true community achievement. Since that release, we’ve been in maintenance mode. The latest Firebug version on AMO is 2.0.19. Officially, we started unifying Firebug with built-in Firefox tools around 2016, but in fact the process began earlier. Mozilla’s strategy was to introduce new built-in developer tools offered as a default in Firefox. Modern developer tools written from scratch. The decision was made not to use Firebug as the platform to build upon. Some Firebug users and contributors were disappointed by this decision, but Mozilla’s infrastructure and requirements were different at that time. Sometimes it’s just better to start from scratch, which is especially true for software development. The process of unifying Firebug with the rebuilt devtools was completed with the release of Firebug 3 (aka Firebug.next) in 2015. This prototype was built as an extension to built-in Firefox devtools and eventually integrated directly into devtools. You can learn about how to migrate from Firebug. You can try Firefox Developer Tools by updating your release browser or downloading Developer Edition. Support for every old-school* extensions stops in Firefox Quantum (aka 57). Yes, including Firebug and that’s why there was great opportunity to write this post. Firebug changed everything for me as a frontend developer. Looking back I cannot remember how hard the times were before Firebug stepped on the scene. Now each browser has mature developer tools. That’s because of Firebug. Mission accomplished! Thanks a lot for your work and for your influence on all browsers. Yes, exactly what Jens says! Firebug made my job so much better and less frustrating. It’s hard to imagine working on frontend code without proper developer tools in the browser and Firebug certainly set the high standard for all dev tools available today. 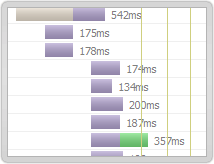 Firefox dev tools seem pretty good feature wise but they lag and get slow when used in big projects. After a long phase of rewrites we are heads down on making the tools faster. You can best follow along on Nightly, or if you like a slower pace, on DevEdition. You can help us by filings any slow issues that get in your way in bugzilla. It was surely great, but I could never figure out how to use it. You can’t imagine the impact it had in many of us to find a tool like Firebug. Thank you very much for imagining it! What I miss most about Firebug (and still do) was the context menus crammed full of useful things. I still spend a lot of time hunting around in the dev tool menus trying to locate a Firebug function. Thankfully some of this stuff was improved in nightly – for example persisting network trail on redirect used to be hidden away in global config and is now on top bar like firebug. Here’s one I still haven’t found a good replacement for though. Firecookie. 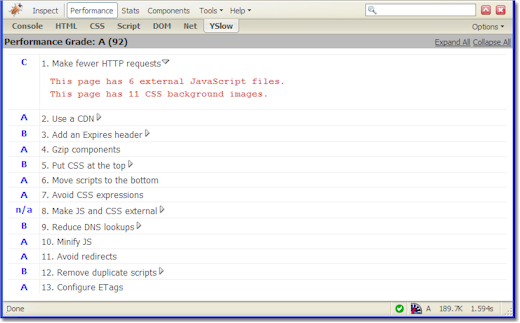 http://m8y.org/tmp/devtools.png left side is devtools. right side is firecookie. In firecookie I got more detailed breakdown of cookie data, and could add/remove from firefox whitelist. Was definitely a nice to have. I used it both for dev and for convenient cookie whitelisting. Great to hear that we covered most of your cases! Those are a lot of options in Firecookie. Since you mentioned whitelist of blocked cookie the feature you are missing most, are you using it for browsing or development? Thanks for your work Jan. Firebug was thru many years my favorite firefox plug-in. It is sad that this great piece of code, and xul extensions, will be ending it’s life. I miss in devtools few things. But lets hope in the future this will at least be as good as FireBug. It is really frustrating, that such great browser and addons will be transformed in to tool which treating users like a dumb, that don’t need advanced functionalities in the name of becoming similar to google chrome. Not mentionig some wired privacy controversions (Cliqz etc). To bring back advanced functionality that power users liked so much we will experiment with additional APIs for extensions in an open way so other browsers can follow. We learned from the past, so we are putting in a lot of effort to implement them in a sane way that is fast by default. Let us know if anything specific is missing in Devtools! Ok, how about fixing developer tools debugger? Well it is not broken but broken is a good word to describe it. To be more specific, setting a breakpoint (in different ways) is broken most of the time. You cannot disable call stack and it lags the whole debugging process. Debugger can’t show the exception location/script in dynamic loaded scripts. Debugger doesn’t show variables on breakpoints set by ‘debugger’ keyword in dynamic loaded scripts and list goes on. Missing a recognition to the inspiration: IE6’s Internet Explorer Developer Toolbar! You did so much work over so many years to steer Firebug through incredible change. Thank you (and the rest of the Firebug contributors) for the hard work on Firebug. And thanks for this nice trip through Firebug’s history. And, of course, thanks also to everyone working on Firefox Developer Tools which made it possible for Firebug to ride off into the sunset. When it came out in 2005, Firebug was the first tool to let programmers inspect, edit, and debug code right in the Firefox browser. Firebug became a standard among web developers. It gave us a tool that significantly helped create a better web experience for everyone. Thanks! Thank you for the great tool. I used it since the very beginning in 2006 if not mistaken. It saved me a lot of time – console, js debugger, net tab to trace Ajax calls and grab curl commands, DOM inspector allowing changes on the fly. I still feel I used not much of the whole range of tools it provided. Always thought one day I’d spend enough time to learn all of them to more efficient. Great tool! Thank you for it. Thanks Firebug! you are salvation of millions of developers. It is your early expedition on the debugging tool that saved billion of hours of all developers, which is invaluable contribution to the community. Joe Hewitt, Honza, the firebug team, and all the contributors, your hard work will always be honored. I remember when I was learning to code (2000 – 2007 and still learning ) and a friend showed me fire bugs everyone was like “What? No way!! How cool and useful!” Thank you! Still I like firebug so much. I will miss a lot firebug. Firebug had a small core team behind it, nontheless it helped millions of users all over the world building and debugging their websites. With that success it had (and still has) great influence on the development tools integrated in browsers nowadays. It was great to work on such a great project and with such a great team! For everone still missing Firebug features in the Firefox DevTools, https://bugzil.la/991806 is tracking them. Anyone wanting to help the team behind them is welcome to do so. A guide how to contribute can be found at https://developer.mozilla.org/en-US/docs/Tools/Contributing. Wish you all the best (Y) for the Future Project ! Firefox made a mistake letting FireBug go. Chrome and Safari have better developer tools. 11 years later I was still using it! Thank you Firebug! You were there for every step! What will happen to Firebug Lite? There are environments like embedded browsers, where no other dev tools are available. Firebug changed my life. I was so hesitant the first time I met Joe and proposed integrating YSlow with Firebug – and he agreed! Then starting the Firebug Working Group – I think I’m still the owner of that mailing list. I remember that first meeting with John J at IBM. We all wanted the awesomeness of Firebug to carry on, and we made it happen. Firebug has been an integral part of growing Frontend Engineering to the preeminent role it now plays on the Web. Thank you for firebug，and it take me into web world during fresh time. Firebug was lifechanging. So awesome. Many thanks to all those hard working devs that built it! I am gonna miss Firebug! Ugh, the transition to FF Dev tools has been painful, to say the least, and right in the middle of a project. I’m glad we have a place to get together and share our pain. That said, the stuff FF Dev tools is doing for CSS grid has been pretty interesting. To the future! RIP you where my inspiration and my many web dev first AHA moments..
Firebug was my guiding light through years of growth as a developer. Always my preference tool. But not Firefox Developer (v57) is my new guide. So far, so-so-so Good! FireLive! The best development tool! A true pioneer. Thanks for all the help over the years, and the rich legacy you leave on all browsers. I got a job at a marketing agency doing super remedial QA testing on newly built websites in 2008. I had a little basic HTML knowledge from a single class I took (and of course from editing my MySpace page). One of the devs showed me Firebug so I could help fix small display issues. I’ve been working as a front-end dev for seven years now. I wouldn’t have a career if not for Firebug. Thanks, lil buddy. We miss you lots and love you… Firebug. Firebug helped me realize my goal of doing my design work in the browser, so I could create and tweak using code instead of pixels. Then after I’d coded the app from the mockups, it was a part of the debug workflow as well. While I’m sad to see it sunsetting, I appreciate every day that it paved the way for the integrated devtools in Firefox. …Wow, I got more emotional there than I expected! I’m going to miss Firefox because I’m not giving up all the really useful add-ons that I use on a daily basis. A lot of my Add-ons the developers can’t convert to the new system. I am sad Firefox is going this way. I’ll use 56 for as long as I can then probably switch to chrome which I’m not a huge fan of either. Firebug was/is THE premier web development tool, and great thanks and kudos to everyone who worked on it! It changed my life as a developer and solidified my decision to go into web development. Before it, front end debugging was an endless list of “alert” statements lol. I am very sorry to see it going. I have known about this for a while, and tried to warm up to the dev tools, but they are still not a worthy replacement, IMHO, for Firebug. One of the biggest things I miss is the ability to edit CSS or HTML on the fly, and see the changes rendered dynamically in the page you are viewing. A great example is working with bootstrap layouts : in Firebug, if I go into the HTML tab and change the column values, I instantly see the changes in the layout of the page – not so with the dev tools, at least not last time I looked. I guess I will have to accept the change, but I am actually using an old version of FF now (49) and disabling updates so I can still use Firebug. That’s how much more I like it than the dev tools. Hopefully, they will eventually get all of the features baked in that made Firebug so beloved. Thank you firebug for all these years. Thank you Firebug & the wonderful team! you are primary reason for most websites rendering as expected. Love you. Swiss-knife of the development team. Thank you Firebug! You help me in all those nights I’ve been making WP themes. This was a life changing tool. It was simply unbelievable back then. What we take for granted today evolved from Firebug. Even though I don’t use Firebug anymore, this news makes me sad. This used to be our saviour! Editing CSS on the spot with the creative director sitting next to me.. man, it saved many hours of going back and forth… can’t believe that was 10 years ago!! Thank you Firebug! Thanks to all developers who contributed to make this happen. Please bring it back. Please!! I have been working with Firefox since version 2 and I am still not disappointed. Great post, we all love Firebug, let’s hit F12 and have one minute of silence. I’m kind of sad the technology that allowed for Firebug to exist is being phased out. Sure, we got to experience Firebug and all the “developer tools” from various browsers now have the same features, but what if the world was always Web Extensions-based? If Firefox wasn’t hackable from the start, we would never have seen Firebug. We wouldn’t even know it could be so good, it wouldn’t be a fond memory. A world with only a monolithic, “safe” and constrained Web Extensions may be a world without the next Firebug, and that makes me sad. Let me also chime in. Firebug was a real lifesaver, and probably the number one reason I got Firefox installed around the workplace. Great job then, and also now with the Firefox DevTools. Keep it up! I’m sad to see Firebug go! Although I’m excited about Web Extensions I still have a (company internal) Firebug Extension which I cannot get feature parity with the current Web Extensions implementation (even in Nightly) until more of the Dev Tools APIs are implemented :( I do appreciate all of the efforts but it’s a slow road to compatibility with Chrome. Really, miss Firebug, it is made by developers for developers, so smartly made!! honestly my productivity as a developer dropped a bit down without such an amazing dev tool. I feel sad and excited. Great work guys you saved millions of hours of developers around the world. Hats off to the contributors. Hey! I like the way the new firefox integrated the web development tools. Firebug not only influenced every single browser out there, it also helped me get into web development. Massive congrats to the devs, we should do a little fundraising for them or something. Man, this is some sad news, i had a lot of time with firebug, it helped to enter the web dev. It says 70 comments at the top but I can only see 14 on the page with no link to older comments. Is this a bug? I feel sad to see Firebug go!! I have been working with Firefox since 2010 and I am still not disappointed. Awww, Its sad news. I have been working on this since 2006/07. Life saver for me on many cases. Thanks very much. I agree with Tanveer on Fundrising. Really sad to see it go. So far there are a lot of little things that firebug did much better than the native debug tool. (most notably it made/showed edits to the markup as you were changing it, not after clicking away.) I actually reverted back to an older version of Firefox temporarily just so I could use it again. Hoping that the native tool keeps getting better. Firebug is always be my first love. As a font end developer I always thankful to it. A friend, a life saver and life changing for so many as mine. Thank you for developers, who shown the future of all web browsers. Firebug is one of those tools that I can’t imagine being without. Great work – be very proud of what you’ve done. Thanks for great job! Thanks for FireBug! Create project and thanks a lot for your effort! Firebug is a division of new web developing era. I will always remember it for sure.